Don’t forget that we’re still running a huge contest for my Movember campaign. Please make sure you donate on my Mo Space page here, and you could win a 5-pack of The Maldonado Dynasty “The Mogul” or a special 5-pack from my own personal humidor. Click the links of the prize packs above to see how you can win. Thanks for everyone’s continued and awesome support! Today we have a fairly limited cigar up for review that I actually don’t think got all that much Press. It comes from the B&M Exclusive line by Pete Johnson of Tatuaje. 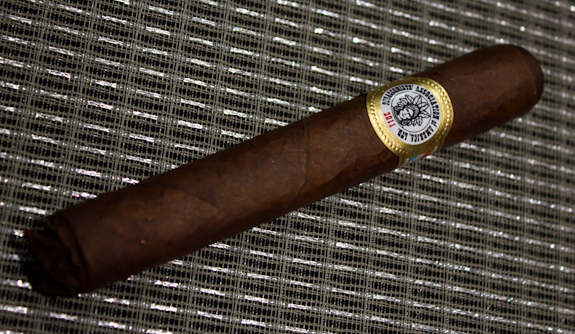 If you haven’t stumbled across any of these before, you can find one of the previous ones reviewed here on Casas Fumando, it was the Tatuaje Barclay Rex 100th Anniversary. 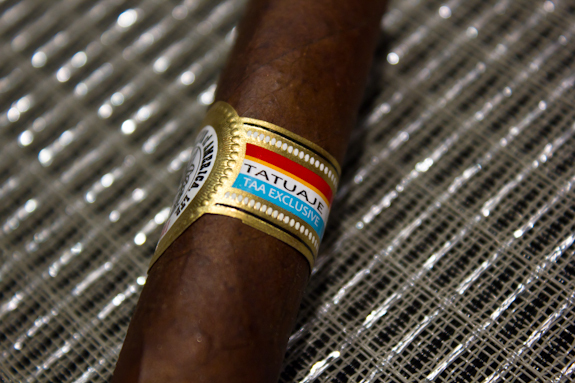 Pete Johnson continues this line with the Tatuaje TAA Exclusive 2011. The TAA in the name actually stands for the “Tobacconists Association of America” and unlike his previous B&M Exclusive releases, you will actually be able to find these in more than just 1 store. The total distribution went out to 40+ TAA retailers across the United States of America. 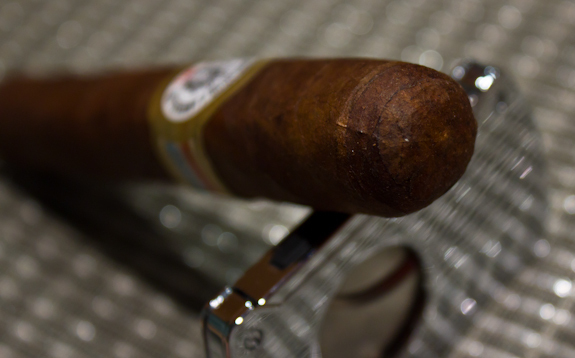 There was also a larger production turned around for this cigar with numbers totaling up at 30,000 cigars. This worked out to 1,500 boxes of 20 cigars per box, and if you had a retailer in your area, they would have sold between $10 and $11 per cigar. As with most exclusives from Tatuaje and Pete Johnson, they don’t last too long on shelves and are already fairly scarce in most areas. One thing that made them a bit of a draw to Tatuaje fans is that Pete hinted the blend was similar to that of the Pork Tenderloin and the Brex. Both of those were limited releases from Tatuaje that were difficult to track down. Pete also decided to change up the shape of this cigar a little bit. You can find that it is a slightly rectangular box-pressed shape and the 5.675 x 54 vitola is also non-standard. I actually found the vitola here to be a good balance between a Toro and Robusto. 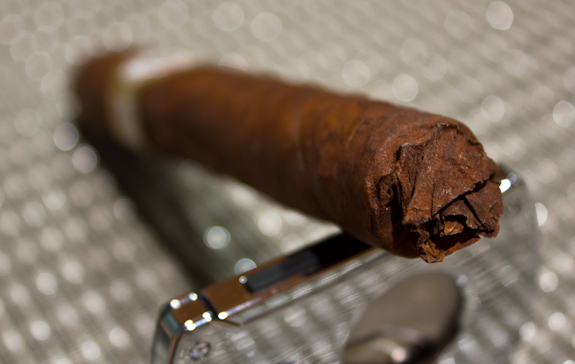 The cigar itself comes wrapped in an interesting Connecticut Broadleaf wrapper. Now the wrapper alone doesn’t make the cigar, but both Tony and I both seem to have a great appreciation for a lot of Broadleaf cigars so I’m hoping this continues the trend. It’s terribly cold out here today but I’ve got my propane heater to keep me warm from the outside and a nice tall bottle of beer to keep me warm on the inside. So let’s see what the Tatuaje TAA Exclusive 2011 has in store for me! 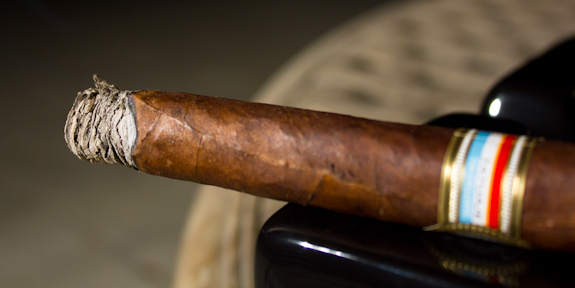 •	There is an absolute insane amount of smoke coming from each draw of this cigar, I could make smoke signals rivalling campfires with this cigar! The Tatuaje showed some promise initially and I was enjoying the flavor profile from the start. 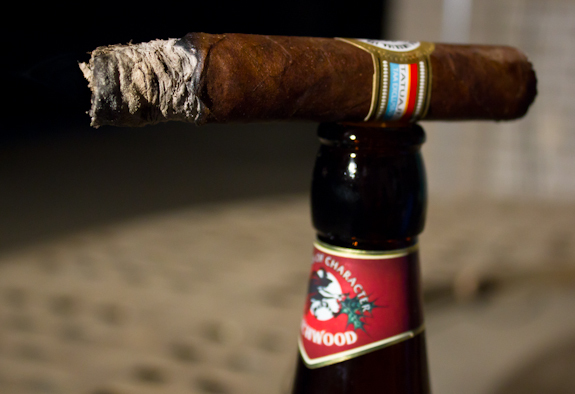 Unfortunately, that profile didn’t change much as the cigar progressed and actually got a little bland shortly after the halfway mark. I also had a few issues with the burn and an extremely open draw. I think the cigar had some potential and maybe needed a little more rest time in the humidor, I’m not too sure. I’ve come to expect a higher calibre of cigars from Pete Johnson’s B&M exclusive lines and I don’t think this one lived up to the expectations I had. I’d definitely want to try another couple after they’ve had time to rest though and see how age treats them. As we all know, Christmas is just around the corner and that means by favorite time of year in the brewery world! Christmas and Winter ales are probably my favorite seasonal brews and there’s always cool gift packs available too. You may recognize the Wychwood Brewery name from their famous Hobgoblin ruby ale which I’ve enjoyed in my review of Illusione 888 Slam and it’s own review here. 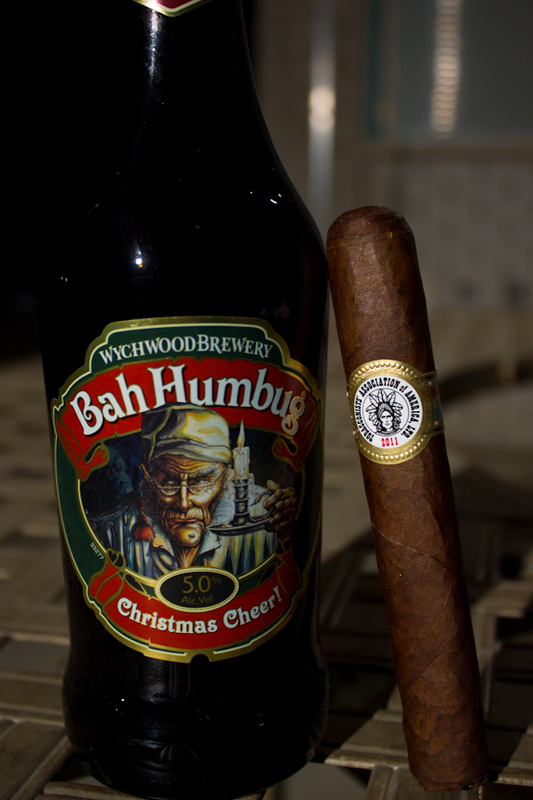 This offering is called “Bah Humbug Christmas Cheer” and is one of theie seasonal ales. I actually found the flavors to be very similar to the Hobgoblin and not as “heavy” as you might expect. It’s basically got that smooth ruby ale character with an added touch of spices common in winter seasonal ales, such as cinnamon. I found it to be a very tasty pairing to the Tatuaje TAA since it offered a change of pace from the cigars profile and kept the whole experience a little more interesting. 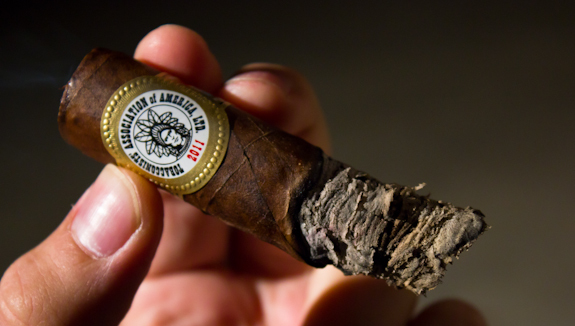 ← Previous Story Movember Week 3 – Still time to Donate and Win some Maldonado Cigars! I have to agree with your thoughts there, PJ makes some great stuff but every once in awhile there’s a dud thrown in the mix. It might just be a matter of different preferences, someone else might think this is awesome. I’ve recently had the Hobgoblin and Bahhumbug beers. Amazing stuff. Really tasty with the added comedic factor. I have yet to try any Tatuaje, but hopefully i’ll get my hands on something soon! For sure man! Hopefully when the weather gets warmer? Or we’ll just crash at Tony’s. He seems to get from great to awesome weather for cigar smoking down in The Paso. el paso weather rocks! Haha there is always room for you guys! This has been my consensus for the most part with alot of these LE’s from tatuaje. So many people raved about these, and I was a little unimpressed. So many people likened it too the Barclay Rex release, and I wasn’t overly impressed with that also….Now things I did like….. I am a huge sucker for a shaggy foot on a smoke and I wish it did have that sweetness in the finish that it does start with. I have a couple left to smoke at a later day. Wolfman was good, just not phenomenal…. I am not a sumatra guy…. LOL Eric, I was actually on a good streak for awhile too. I think we both do enough reading that we try to avoid crappy cigars if possible, but every once in awhile you take one for the team or you try one out in the hopes that your opinion is different from someone elses. In this case, I read bad things and hoped for the best, but I was let down. Oh well! Thanks for the comment!